Published: Jun 4, 2018 · Modified: Apr 11, 2019 · By Jen Sobjack · This post may contain affiliate links. 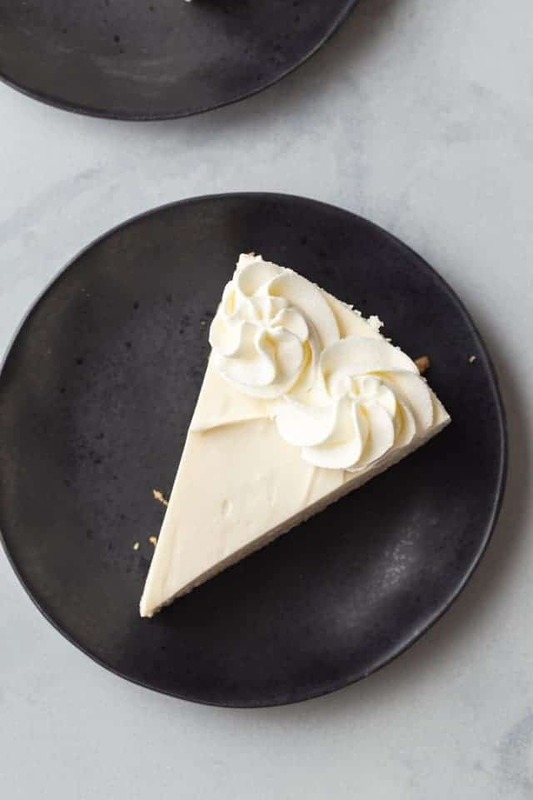 I’m adding more cheesecakes to the archives! And they are a couple of no-bake recipes. Yay!! I took my perfect cheesecake recipe and turned into a silky no-bake version. It’s going to become your go-to cheesecake for summer. The graham cracker crust is held together with melted butter that hardens as it cools. The filling is a mixture of cream cheese, confectioners’ sugar, vanilla, and heavy cream that’s whipped together until it’s fluffy and light. After getting this basic version perfect, I added snickers candy bars. You don’t want to miss the no-bake snickers cheesecake version! What is a no-bake cheesecake? A no-bake cheesecake doesn’t require an oven. Everything from the crust to the filling is mixed in a bowl, added to the pan, and refrigerated until it’s set. No bake desserts are perfect during the peak of summer when it’s way too hot to have the oven on. 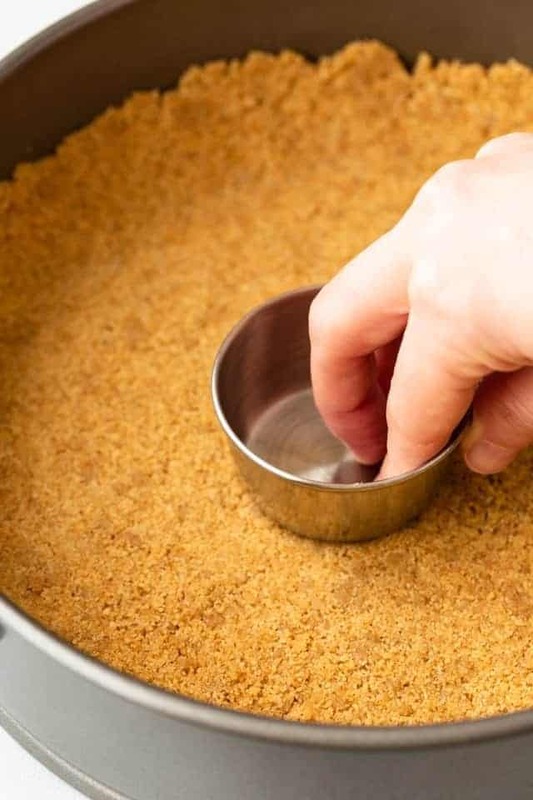 Graham cracker crumbs – grind 1 and 1/2 sleeves until you have a fine crumb. Butter – melted butter will coat the ground crumbs acting as a glue to hold the base together. Cream cheese – makes up the base of the filling. Use full fat, block cream cheese for best results. Confectioners’ sugar – sweetens and adds structure since it contains cornstarch. Plain powdered sugar will not work as well. 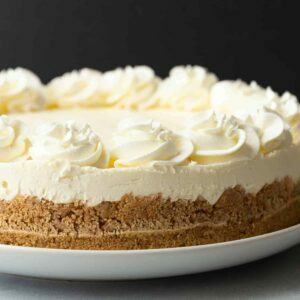 Heavy whipping cream – will whip up into a thick consistency which will give the cheesecake body as well as make it light and creamy. 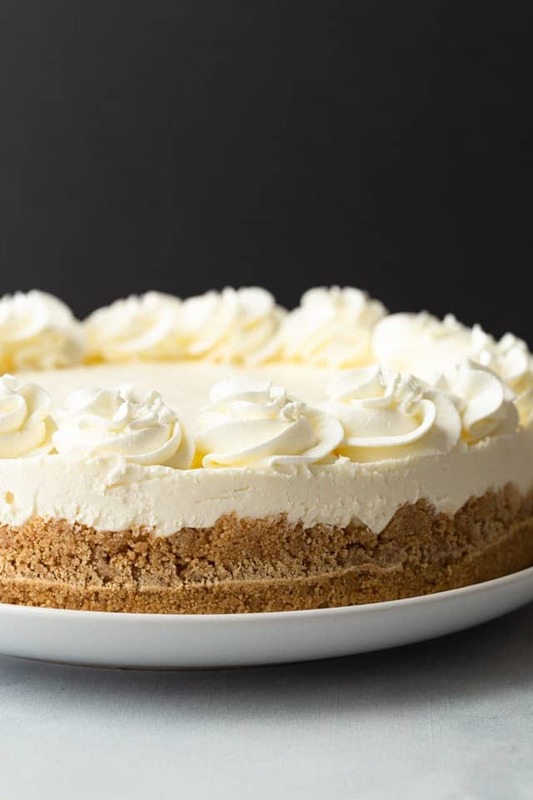 How to make no-bake cheesecake? Combine graham cracker crumbs and melted butter. Make sure to get all the crumbs well coated then press them firmly into the bottom of a springform pan. Freeze the crust while you make the filling. It’s important to beat the cream cheese until its’ smooth and free of lumps before adding the other ingredients. Mix the batter really well after adding each ingredient. After adding the cream, beat the filling until it becomes thick and stiff. Spread the filling over the prepared crust and refrigerate overnight. Plan ahead. 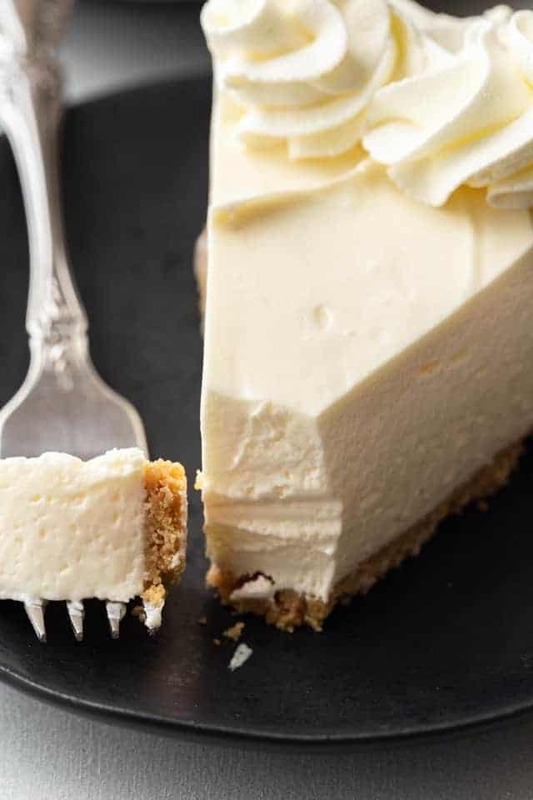 The cheesecake doesn’t require baking but it does need to refrigerate for at least 8 hours. Get those graham cracker crumbs well coated with butter! The butter will harden once cooled, acting as the “glue” that holds the crust together. Use full-fat cream cheese for best results. Make sure the cream you are using is indeed “heavy whipping cream”. 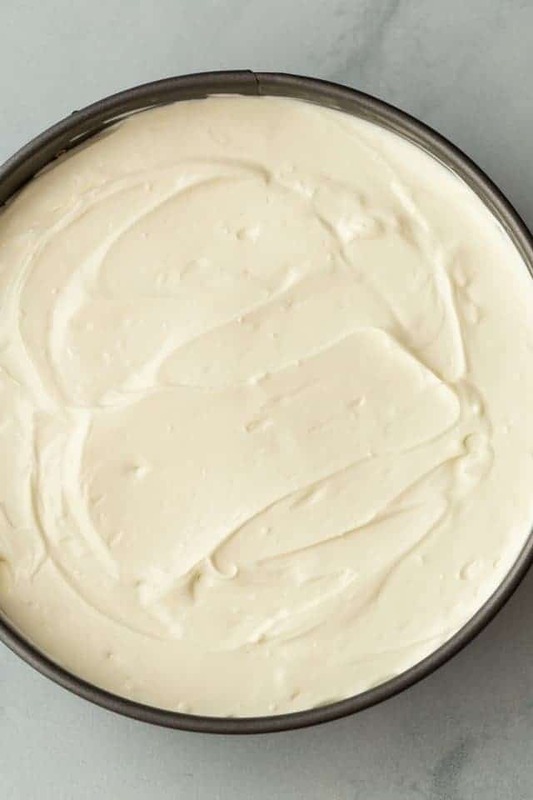 The higher fat content will allow the cream to whip up thicker which is needed to hold the filling together. If using a stand mixer with paddle attachment, switch to the whisk attachment and add the heavy cream. Beat on low speed until the cream is well mixed in. Turn the speed up to high and beat until the batter becomes thick and stiff. Pour the filling over the prepared crust and spread to the edges of the pan. Refrigerate for at least 8 hours. 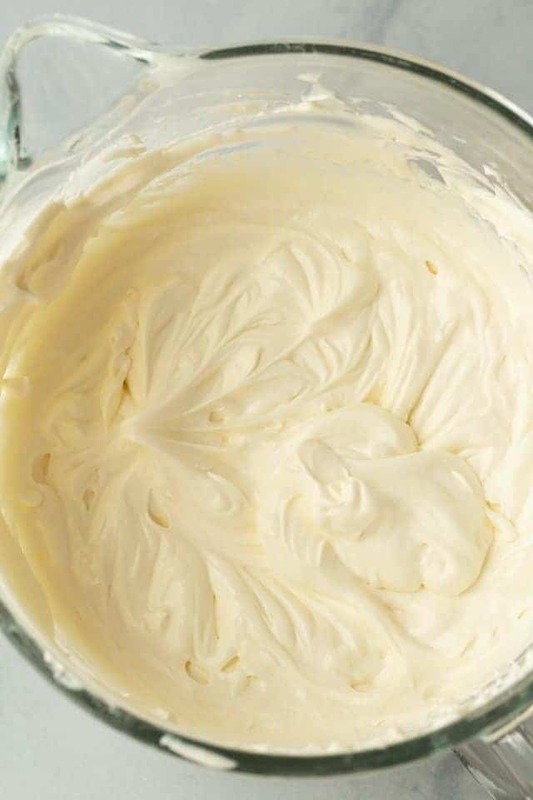 I just have a hand mixer will that be okay for the cream cheese? I make thumbprint brownie bites with salted caramel in the center for parties all the time, but I am totally trying this filling for a brownie-cheesecake version!!! That sounds incredible! Please let me know how it turns out! This looks delicious and I will be making it this weekend. Are the rosettes just whipped cream or are they the cheesecake mixture? Hi Lisa! 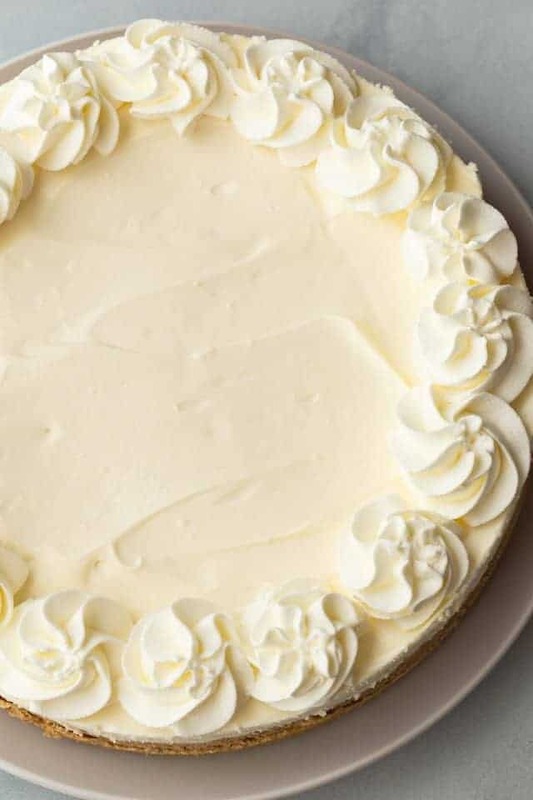 The piping is just whipped cream but using some of the cheesecake mixture would be a great idea as well! This is one of my favorite cheesecakes!